She sat on her coach in the small apartments in the street behind the metro station . It was many days since he had come. As she read the newspaper and went out with her friends, she tried to put her other part of life out. She was at home that evening. The other girls were out in front of the dabba. It was a Friday evening and there would be many people there - hungry vultures who would, later that evening, crowd the tin shack in which Didi had created makeshift rooms for her and the other girls. Sabina had worn her red dress - she had suggested to Sabina that she should wear it. A few minutes before she heard Sabina's laughter, not her usual one, and she heard a throaty voice softly answering her - the scorn lazed in the voice - Sabina and the other girls had gotten used to such tone - it was the one that she had never heard in his tone. She turned the page of the Filmfare she had been reading - there was a section on Hollywood in it - Julia Roberts stared from it with her innocent look towards Richard Gere. It is all the same everywhere - she threw down the magazine in disgust. She had not felt like going out since the night he had been there. Everything else felt immaterial now. She had some savings left for sometime and Didi could be kept quiet for a few more days. After another couple of weeks questions would start. Yet, her mind did not feel upto it. She could not start it all again after what had happened. She would have to find a way to escape. She looked up from her seat and listened as Sabina's footsteps and the pair with her walked towards the window. Curiosity made her glance at the bars lining the window - Sabina's face passed and another. All her muscles froze - the familiar face passed by. This time she heard the voice clearly and there was no mistaking it. Yet, the tone was different - every one of Sabina's sentences were met with cryptic sarcasm. She watched as the red passed - it was the dress she had bought the evening they had been together in Ranganathan Street. He could not have mistaken it. As she sharply turned away from the window, her gaze fell on the table next to the bed. There was his handkerchief and a packet of her tissues next to it. Handkerchief: "A piece of cloth, usually square and often fine and elegant, carried for wiping the face or hands". Kleenex: "a soft, disposable paper tissue esp. for cleansing the face or for use as a handkerchief. " Handkerchief - the one you used many times over and over again. Kleenex - the one you threw away. There are some places that reek of memories and she walks all over the splintered glass - yet it is a part of her life and she cannot avoid those places. She was there days back both during the morning and late at night building new images and she had thought that she had wiped out the last ones. She found that new images were not enough to shatter the ones created before - every corner she turned had a memory stowed away - tears rose and lump formed in her throat at each of those memories. She looked up and there was another of those. At times they turned to flood and there was no distinction between what came from the sky and from her eyes. The raindrops fell on the windscreen blurring the images and yet, the wiper came and cleared the glass again. She wiped her eyes resolutely. When could she be normal about those corners again? "Doc, uh, my brother's crazy. He thinks he's a chicken." And, uh, the doctor says, "Well, why don't you turn him in?" And the guy says, "I would, but I need the eggs." irrational and crazy and absurd and ... but, uh, I guess we keep goin' through it because, uh, most of us need the eggs. The days were bright and the sun was just rising. Laks and she were out on their bicycles. Laks had the support wheels as well. The biked fast towards the outer ring of the garden and she stopped her bicycle where the track ended. Getting off it, she ran towards the lean tree with the tree long branches and looked up the branches. There were 4 small red and green fruits. She counted them and bounded on the bike again onto a new track and biked towards the eucalyptus tree. Laks tried to keep up with her and caught up "you are too fast" - Laks told her. She silently pointed to the yonder - the sun was setting over the misty yonder and the red rays spread over the mountains and splayed onto the eucalyptus tree. They both looked at the scene with childlike wonder. The white shroud lay with a lamp at the head. Many of her favourite aunts and uncles sat with their heads lowered. She searched for her mother in between and could not find her. She walked to the inner room and her mother lay on the bed. She nudged the seemingly sleeping body and told her - "Mom, I want to have something to eat". "Well... you know where to find the cornflakes" - her mother replied with a sharp edge to her voice. She knew not to disturb her at this time. She ran back to her favourite uncle. He was busy giving some instructions to some workers - "go find your cousins" - he said. She went to her grandfather - he had a vacant look on his face - he told her to go to her aunt. She went to her aunt - her aunt had tears running down her face. She went out to the jasmine tree. She remembered her grandmother used to make her collect all the flowers and string them on a needle attached to a long white thread. She decided to ask her grandmother for the thread. Going into the living room, she nudged the white shroud. "Daadi" - she said - "I want a needle and a thread". Wails rose all around her. People beat their chests. She lay next to him - it was morning and he drew her to him. She felt beautiful. There was piano notes floating in from outside. The sun shone through the windows and the gold colours encompassed her. She did not feel the missing leg - she felt as if there was an extra leg instead. The accident seemed so far away. He had made her feel whole again. The missing parts were all drawn together. It seemed a different world completely. For the first time she felt live - she felt she could accomplish anything. Facing anything in the world seemed possible - why? - she could even finally hold her exhibitions. She got up from the bed and grabbed her paintbrush - she opened her red bottle and dipped the brush - a line was drawn on the white canvas. He was moving out - he said it was all a big mistake. Her leg was gone. She felt bloated and ugly. He glanced back as he walked away - she hoped he would be back - there was no more glances, there were no more endearances. The hopelessness engulfed her. She looked at the black bottle - no lines came out - she did not even feel like lifting her paintbrush - it all seemed too heavy - it all seemed like too much effort. Her eyes met his - it clouded over with anticipation. Her umbrella fell of her hand - he picked it up for her. As he passed it to her their eyes met again. She felt her crutch fall away - and felt it being grabbed and tucked back. They exchanged no words - yet, they knew they would be back again. She had crossed the road - she stopped at the shop window - there was an Easel - she went in and opened her wallet. With the easel tucked under her arm - between her crutch and her arms, she walked out. He came out of the shadow and took the easel - "Can I help you?" - he said. She smiled. Is it really so easy to cross the road - it did not seem possible - she thought. "Kochapoopa - don't pinch me". "I am not pinching you - they are big red ants". "Now I am old enough - you cannot fool me anymore. I know they are not red ants - you are pinching me". The old voice laughed again - "she has grown up - she does not believe me anymore". The tall slim figure with grey hair walked out of the kitchen with fish curry in her hand. She smiled as her husband teased his brother's granddaughter. 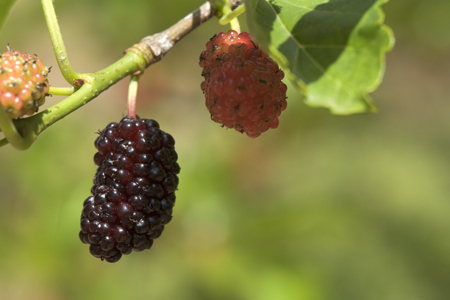 The mulberry tree listened to the conversation and years flew behind. There was now a little girl in a grey and red frock. Her sister was trailing behind her. The older one ran all around the place - she went to all people and charmed her way into getting her things. "Vavachechi, I want the hibiscus flowers - can you pluck them for me". As Vava extended her hand, the little girl suddenly bounded onto the nearest branch of the tree next to the dining room. She had seen the black fruits hanging. She would climb it high and swing on the branch reaching out to the reddest crinkled surface. The tree had felt like small silk feathers dancing on its arms. She was light with nimble feet. As the little one reached out to a red one, the tree braced itself for the pinch it was going to receive. She pulled at its skin and there was the first one. Here was another one - and suddenly there were 5 in one part of the branch all together. The tree swayed a little in protest - one of them was not yet ripe - "leave my young ones - take the ones that are ready to go". As she plucked she threw it down to her little sister - it went into her tiny coconut shell. All of a sudden there was a yell and the tree looked up - there was a huge red ant on the little one's small hands and a couple more on her feet. She bounded down with all the energy and went running to her grand-uncle "Kochapooppa - these are real red ant bites - see how they look. It is not the same as when you tell me there are red ants - I cannot see them at all". Sitting next to him, she would pick the coconut shell from her sister, divide the berries into two and start putting them one by one into her mouth. The tree now waited for the grown one to come bounding to her. As it waited it saw a face appear at the door. She braced herself. The face looked out of the window - "Kochapoopa - you still have the mulberry tree". The tree waited in anticipation. Her fruits shivered waiting to be plucked. The grown girl looked away. The conversation continued inside - the laughter floated outside. There were soon goodbyes and the tree heard the car being driven away. The fruits hung low - waiting to be picked. The old mulberry tree had seen it all.